Football fever is alive and kicking, so it’s time to embrace the beautiful game and celebrate with friends, family and great food. Win, lose or draw, we’ve got a selection of recipes inspired by the different European nations heading to France, so you can feed the fans through half-time, extra time and dare we say, penalties. We’ve hand-picked popular dishes from 9 nations involved in the biggest football event in this summer, not forgetting an extra English favourite. Experiment with these new recipes or use them as inspiration to give your favourite party food an exotic twist. Hosting the tournement are France, and luckily for foodies, the French are known for their delicious flavours. 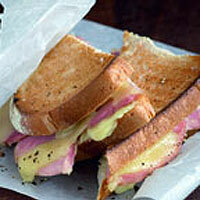 For football-friendly French food, try the French café favourite croque monsieur. Despite its name, the French fry may very well be Belgian. While we dwell on the importance of possession on and off the pitch it’s worth noting that Belgians consume the most fries per capita in Europe. Serve our oven baked fries to hungry fans. The idea of wrapping meat in pastry had been about since the Romans. But the Brits perfected the puff pastry sausage roll and it caught on as the takeaway of choice, long before the advent of the hamburger. 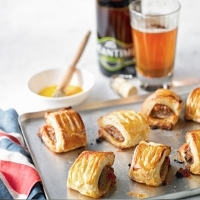 Fly the flag with our fruity sausage roll recipe. 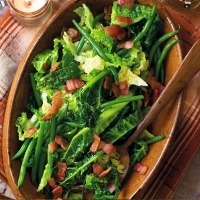 Caraway seeds are a standby of Irish cuisine and have long been used to add flavour to cakes, breads and dishes like our cabbage with bacon and caraway seeds. They are also reputed to have special powers, so keep a close watch on the national team. For a taste of Italy, it has to be pizza and pasta. Simplicity at its best, pizza and pasta dishes are some of the most popular in the world for a reason. For more Italian recipes try our spicy bacon, mushroom and tomato pasta and burrata with roast tomatoes and pesto. If the Spanish hadn’t introduced the potato to Europe in the late 1500s you wouldn’t be able to prepare our delicious recipe for vegetable tortilla with tapas. Enjoy it hot or cold, washed down with our refreshing homemade sangria. 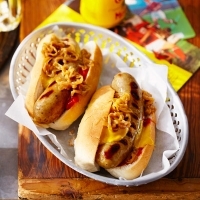 Look to Germany for a recipe that combines 2 footie favourites - hot dogs and beer. The Germans are experts when it comes to sausages, so why not try Bavarian Bratwursts instead of your everyday hot dogs. For more German recipes try our Zwiebelkuchen and German potato salad. According to one historian there was once an English, Irish and Scotch Rarebit too – but only the Welsh variety survives. That staying power may come in handy during the competition. Our Welsh Rarebit recipe is quick and easy. Russian blinis – being round – were traditionally prepared at the end of Winter to celebrate the return of the sun. 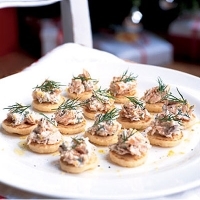 Our blini recipe adds kiln-smoked salmon to create a luxurious canapé for football loving foodies. 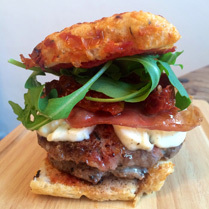 As burgers tend to be staple football fodder, we’ve asked a selection of food bloggers to create tailor-made burger recipes themed to a selection of countries that are taking part in the games. Impress your guests with these football-themed burgers or try your hand at creating your own unique burger recipe. A fusion of pancetta, prosciutto, fresh basil, mozzarella and sundried tomatoes, these aromatic flavours of Italy will leave your taste buds dancing in delight. 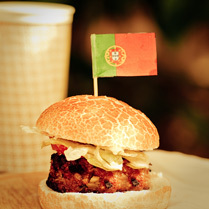 Pork mixed with piri piri and topped with a generous helping of garlic mayonnaise makes this the perfect burger for Portuguese food lovers. 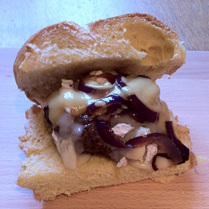 A brie crowned burger with a hint of Dijon honey mustard captures the flavoursome and filling taste of France in every mouthful. 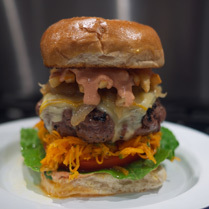 A twist on the well-known Belgium ‘American’ sandwich, this combination of meats, frites, sweet bière onions, carrots and brésil sauce will not leave a burger lover disappointed. 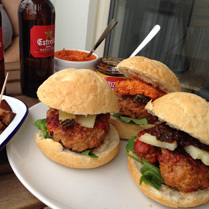 This Spanish burger sensation blends chorizo, smoked paprika and manchego for a real kick. 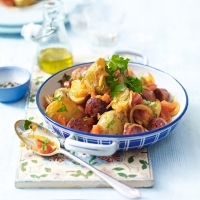 Topped off with popular tapas dish patatas bravas on the side.